This article is about the comic book story arc. For the video game, see Spider-Man and Venom: Maximum Carnage. Cover of Spider-Man: Maximum Carnage (2004)Trade paperback collected edition. "Maximum Carnage" is a fourteen-part comic book crossover published in Marvel Comics' Spider-Man family of titles in 1993. It featured Spider-Man, Venom, and a host of other superheroes teaming up to face Venom's murderous offspring Carnage and his team of supervillains. 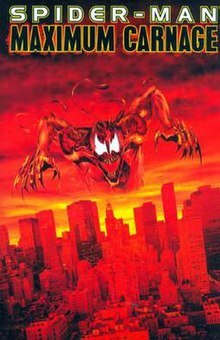 Since the alien symbiote he was bonded to was destroyed during his capture, Cletus Kasady is presumed powerless and jailed at Ravencroft Asylum. However, the symbiote mutated his blood prior to its destruction, enabling Kasady to generate a copy of the symbiote and break out. During his escape, Kasady—again calling himself Carnage—frees fellow inmate Shriek. However, Carnage finally turns on the rest of his gang, and, in the ensuing battle, Shriek is distracted from using her psychic power. Taking advantage of the lull, the heroes acquire a device from Stark Industries which projects feelings of love and hope into the villains, overwhelming them. Carnage flees, faking his death by covering a victim in a mock symbiote costume, and the others are captured. Once the heroes are dispersed, Carnage ambushes Venom. However, the device has left Carnage frantic and confused, and Venom pounds him relentlessly before tackling him into an electrical generator. Carnage is knocked senseless and left to be incarcerated. This arc was collected as a trade paperback in September 1994 (ISBN 0-7851-0038-5), and a new edition was released in January 2005 (ISBN 0-7851-0987-0). This storyline served as the basis for LJN's 1994 video game Spider-Man and Venom: Maximum Carnage, which was released for the Genesis and the Super NES video game platforms. An action figure line was released by Toy Biz to capitalize on the crossover's success. The line featured Spider-Man, Venom, and Carnage. During Halloween Horror Nights 12 at Universal Orlando's Islands of Adventure, Marvel Super Hero Island was converted into a scarezone based on the story arc, and a full haunted house called Maximum Carnage was created. In this version, Carnage has killed all of the Marvel Superheroes that came after him, resulting in criminal gangs running the streets. Certain items gave the island the appearance that famous superheroes fought (and lost) on the scenery, resulting in their death. This page was last edited on 18 March 2019, at 01:20 (UTC).